Welcome to Hong Leong Connect, the mobile banking service from Hong Leong Bank & Hong Leong Islamic Bank that enables you to bank with ease anytime, anywhere across multiple devices. But that’s not all, you can also bank in your preferred language as the Connect App is available in 3 languages – English, Malay & Chinese. What’s even better is you can now chat to do your banking on Connect App! • Access your account securely & swiftly using Biometric. Available for selected smartphones only. • Request Mobile (previously known as PEx Request) –send payment request to a mobile number of another Connect App user & get the money transferred to your account immediately once they accepted the request. • ATM Withdrawal (previously known as Card-less Withdrawal) – Forgot your wallet? Don’t worry! Initiate an ATM withdrawal code directly from the App instead. • Scan & Pay (previously known as PEx+) – Just scan the QR code on the retailers’ websites to pay directly from your account when you shop online. • Locate Us and get a quick access to Hong Leong Bank’s nearest points of presence, based on your current location. 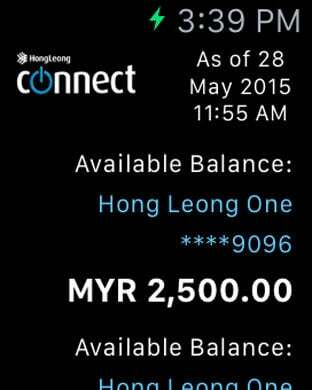 The Connect App is available for Hong Leong Bank and Hong Leong Islamic Bank retail banking customers in Malaysia only.